It was forecast to be a very cold day when I drove up to Dillon, Colorado to play solo flute for an elegant winter wedding ceremony. I was well prepared with lots of warm clothing, a hot drink, and a couple flutes in case one of them froze. The bride and groom and their guests were all from Florida and Texas, and they enjoyed seeing the novelty of the snowy landscape. They were also extremely cold! When I arrived, it was cloudy with a temperature of 14F and a windchill of -5F, with wind guests up to 25 mph. Despite the chill, the setting was absolutely picturesque, and it was like being in a winter paradise. The view of Dillon Lake and the snow covered mountains was dressed in the muted winter tones of deep green pines, the blue-black lake, the grey sky, and the clean white snow. My flute music gave the setting a touch of sophistication, celebration, and elegance. The bride had rented a nice warm patio heater for me to stand by, but when I moved it to the location where I needed it to be, the flame went out and I couldn’t figure out out to relight it. Neither could a few of the guests who tried. However, as one of the guests joked, it was mentally encouraging just to be standing under the heater. When the groom arrived, he noticed the problem and in five minutes he had the heater working! It was just in time too, because my flute was just starting to freeze and the keys were just starting to stick. I played a set list of contemporary music that the bride requested. The start of the wedding was delayed by 30 minutes, and the guests enjoyed hearing my music as they waited. After the wedding, everyone cheered the couple and toasted them with champagne. Everyone scooted out pretty quickly after the ceremony was over, and I was the last person on the overlook. The sun was just starting to set, and other than the sound of the wind in the pines, the silence was profound. I took a minute to drink it all in and to feel the grandness of life and nature. Quick Tip: Are you having an outdoor wedding ceremony in cold weather? Supply your guests with blankets, heaters, and warm drinks. Celebrate the winter theme! Hire my solo flute music to add simplicity, romance, and elegance to your wedding ceremony. 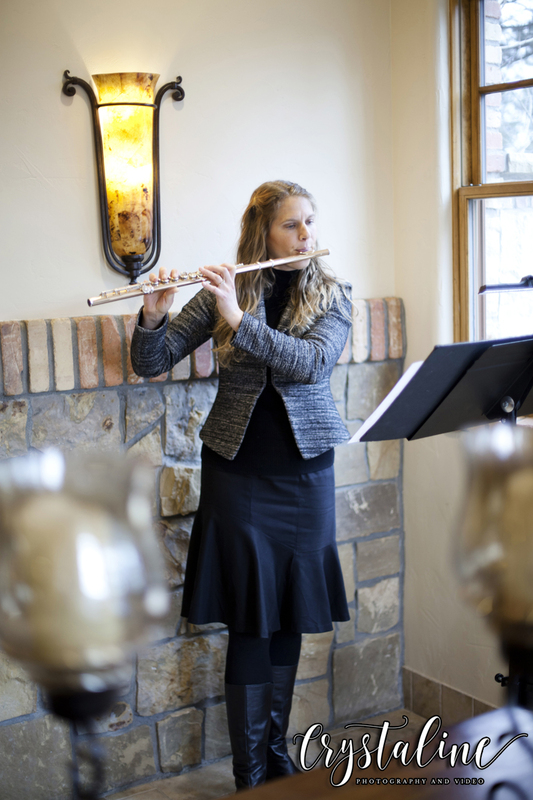 My flute and guitar duo headed up to Vail on a chilly day in early October to play for a wedding ceremony at the Vail Golf Club. A cold front was moving in, and the weather forecast called for cold temperatures, wind, thunderstorms, and possibly even hail. We were all praying that the weather would end up being beautiful so that this couple could have the elegant wedding ceremony of their dreams. 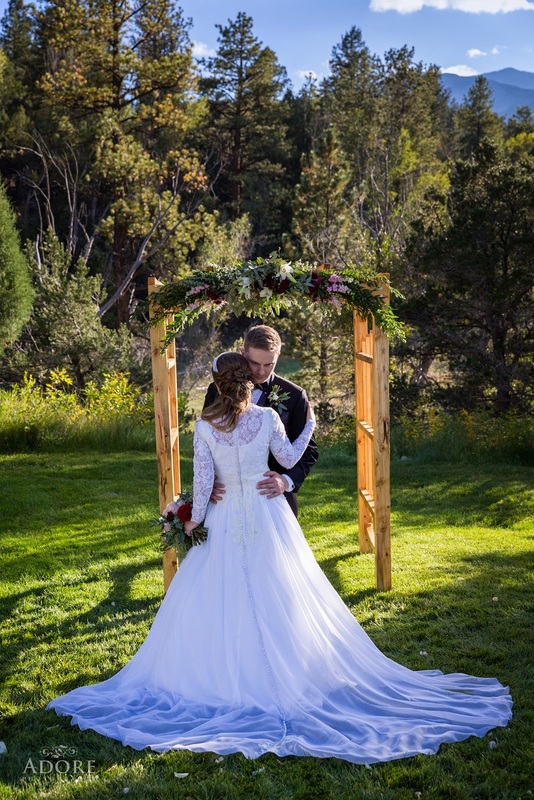 Because of the cold temperatures, the wedding location was moved from the wedding island to the beautiful lawn space right in front of the Vail Golf Clubhouse. It was the perfect location for the guests to enjoy the heated patio, and then move outside to their seats right before the ceremony. 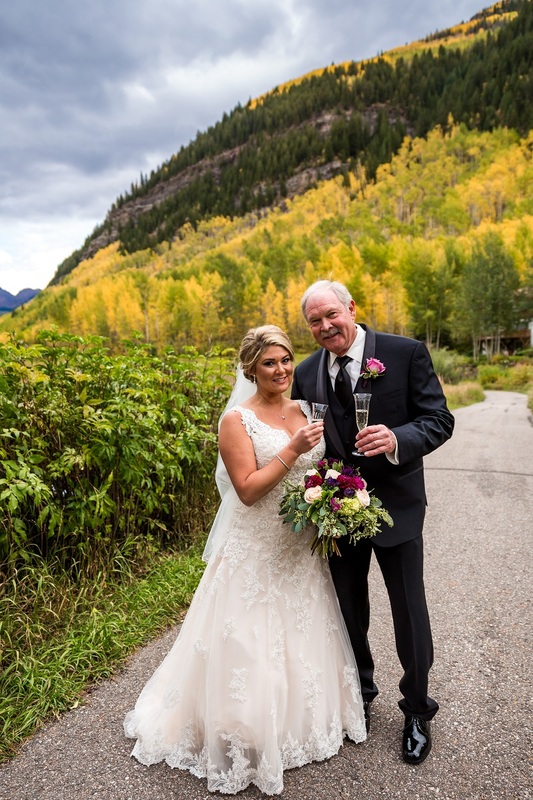 There were a few sprinkles of rain during the ceremony, but the couple was able to have their ceremony outdoors with the stunning autumn colors and the sweeping mountains of the Gore Range as their backdrop. After the wedding ceremony concluded, the clouds poured rain and the guests moved back to safety under the covered patio to enjoy cocktails and our pop and jazz tunes. If your wedding day isn’t sunny, it’s actually a great thing for photos! On cloudy days, colors pop and shadows disappear, making photos of both people and scenery brilliant and beautiful. If you don’t mind getting a little wet, rain and snow also add a sense of drama and romance to your wedding photos. It was a cool and very windy day autumn day on the Holy Cross Event Deck in Vail when my flute and cello duo played for a stunning wedding ceremony accompanied by some fun and unique song selections. The groom had his heart set on hearing a few of his favorite rap songs played instrumentally. He sent me several music samples on YouTube and I knew that I could make awesome arrangements of the songs for flute and cello. To make the arrangements, I combined both the original and classical versions that the groom sent me, and then I added a touch of my own flair that made them work well specifically for flute and cello. It was so helpful that I play both flute and cello, because I was able to incorporate some really cool sounds that very playable on each instrument. I also made a special arrangement of “The Book of Love” by Peter Gabriel to accompany the bride as she walked down the aisle. The day was extremely windy, but we were well amplified with my professional sound system, so our contemporary and rap songs were heard by everyone. We continued to play after the ceremony as photos were taken. The aspens were still in peak leaf, and the golden leaves made for an epic autumn backdrop. It’s trending right now to feature music such as rock, rap, and pop on classical instruments. I enjoy making professional music arrangements of your favorite songs, in any style. I spent the Halloween of 2018 in the best way possible - playing for a romantic Colorado mountain wedding ceremony! The bride and groom were from Florida, and they had their outdoor wedding ceremony in Estes Park at a private home. The drive to Estes Park is one of my favorite drives because of the beautiful scenery. It was made even better by the fresh snow that had fallen the night before. The snow was still clinging to the evergreens and weighing them down like heavy white frosting. The house was in a grand setting with a panoramic view of the surrounding mountains. I played flute along with my violinist inside, next to the crackling wood fire in the fireplace. I set up my speaker outside so that our music could be heard both indoors and out. We played an elegant mix of classical music, and a few modern songs. I made a special arrangement of “All I Ask of You” from Phantom of the Opera and “A Dream is a Wish Your Heart Makes” from Cinderella for the bride. Just before the bride walked down the aisle, we happened to be playing “A Postcard to Henry Purcell” from Pride and Prejudice, and it was such a romantic beginning to the evening festivities. The wedding ceremony took place outside, and even though it was chilly, the sun shone brightly in a very blue sky. The small group of family and friends stood during the short ceremony. Afterwards, we continued playing more lively classical music as the guests mingled inside and outside. Fun Tip: For an outdoor wedding ceremony in the snow, have your ceremony near an indoor location to give your guests the option of mingling indoors before and after the ceremony. 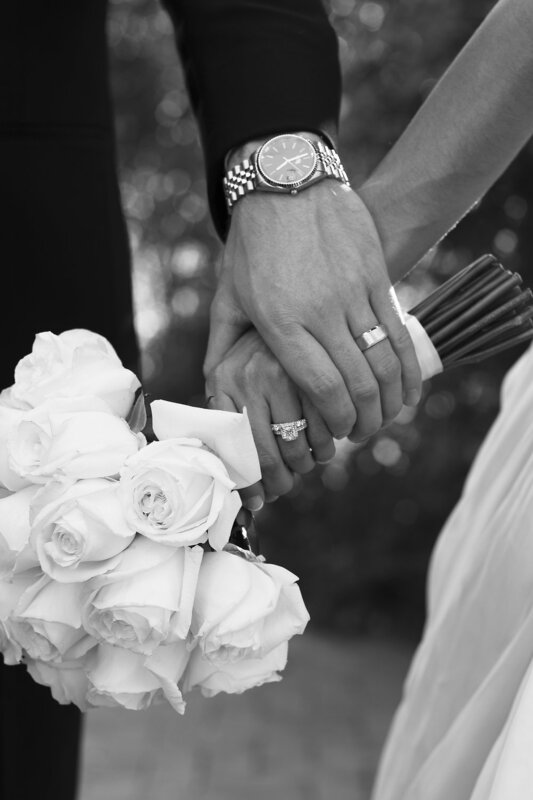 Experience the traditional elegance of my flute and violin duo for your wedding ceremony! On a late summer day, my flute and cello duo played for an elegant formal wedding ceremony at the Denver Botanic Gardens. The garden beds were spilling over with glorious autumn flowers, red berries, and ripening golden grasses. The ceremony took place in the Romantic Gardens, which were a lush, green oasis despite the hot and sunny 90 degree day. Our duo played elegant and fun classical music to greet guests as they arrived. The little gazebo that we played under had the perfect acoustics for our instruments, and our music floated throughout the gardens, mingling with the flower-scented air. Fun Tip: For a hot outdoor summer wedding, invite your guests to wear fancy hats to stay cool. 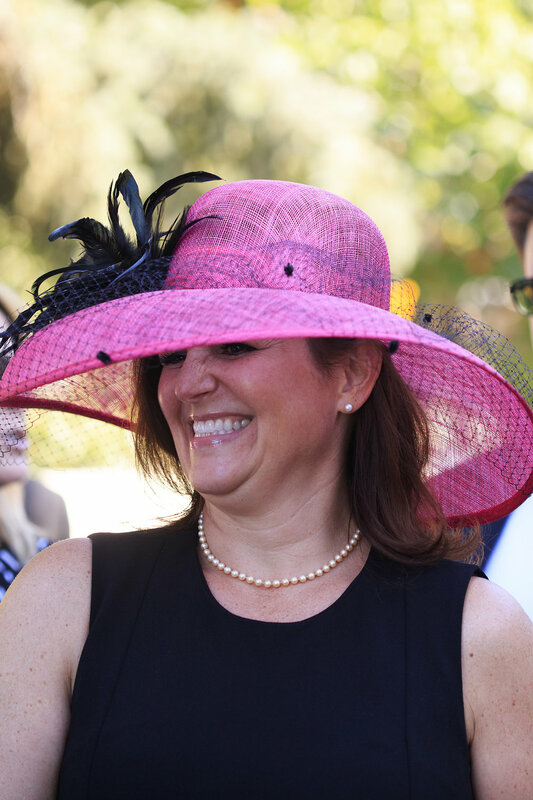 I loved the hats that the ladies wore at this wedding ceremony! Just check out these sweet accessories. Photographer: LD Photography - Thank you for these beautiful photos! Officiant: Scott Bebee - Awesome officiant who I had the pleasure of working with a couple times this year. 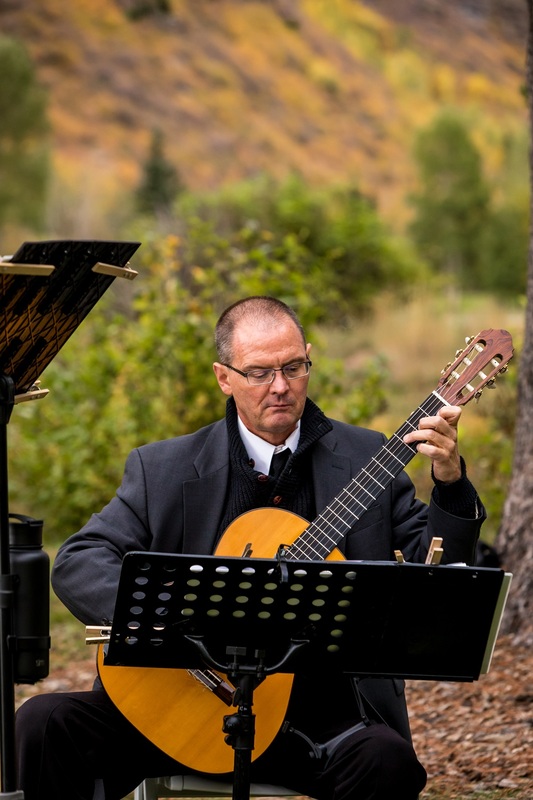 Whether you’re getting married in a garden or in the mountains, our elegant music will bring elegance and class to your beautiful Colorado setting. Listen to flute and cello music samples. It was a beautiful and crisp day in late summer, when my flute quartet (flute, violin, viola, cello) headed up to a very special location in Estes Park, Colorado. We had the privilege of playing for a wedding ceremony at Camp Timberline, a camp owned by the family. The camp was located in an isolated Colorado location and it featured panoramic mountain views with nothing around for miles. In addition to playing flute at this wedding, the bride gave me the special opportunity to arrange a number new songs in various musical styles. I rehearsed with my quartet a week before the wedding so that we'd play the new songs seamlessly on the day of the ceremony. Some of the songs that were written for solo voice and guitar were challenging to translate to a quartet setting, but with a little creative thinking and a lot of experimenting, I was really pleased with the end results, and enjoyed the process. This Georgia bride's song requests ranged from Thunderstruck by ACDC, to hymns and contemporary Christian music, to country, pop, and rock songs. The processional was a mix of contemporary Christian songs played and sung by a few friends of the family, and then we played "Sheep May Safely Graze" by Bach for the moms, and transitioned to Thunderstuck by ACDC for the groomsmen's entrance. Afterwards, we performed a custom playlist that the bride had selected as the guests enjoyed cocktails out on the lawn. In late August, my flute and violin duo enjoyed playing for a mountain wedding ceremony at the Vail Wedding Deck. I left Denver well prepared because the weather forecast was predicting cool weather, rain, and thunderstorms. I really hoped that this Wisconsin couple could have the Colorado mountain wedding of their dreams, despite the weather predictions. As I ascended the mountains and drove to Vail, the temperature dropped into the 40's and it was pouring rain. By the time I reached Vail, the rain had ended and the air had a cool and fresh feel to it. The smoke from the summer wildfires was momentarily completely gone and everything felt bright and clean. The sun started to peek through the clouds, and as the guests arrived, we greeted them and drew them to the seating area with our elegant classical music. 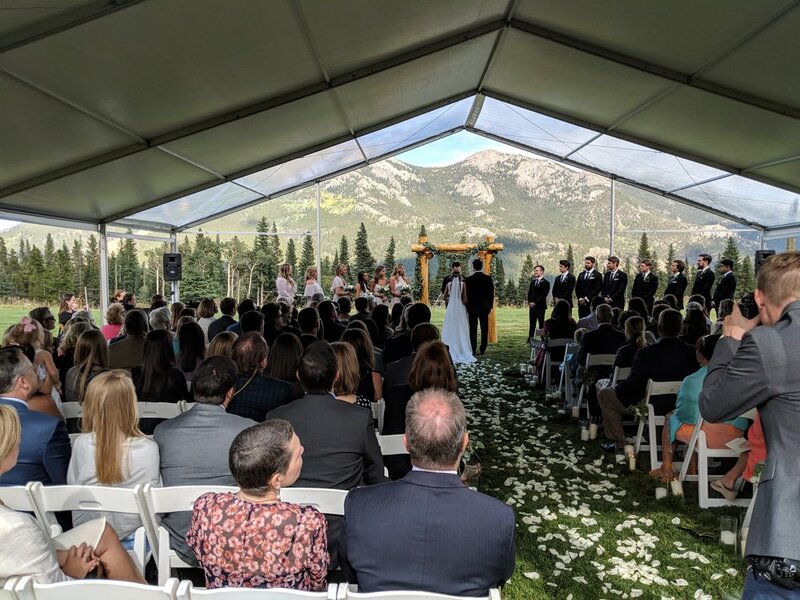 In the middle of the ceremony, we played "Can't Help Falling in Love" by Elvis as a beautiful musical interlude, while the guests had a chance to take in the mountain views and to enjoy the completion of their journey to arrive in this epic setting. Most of the guests had a plane flight, car ride, gondola ride, golf cart ride, and walk to arrive at the wedding deck. We played a lively recessional at the end of the ceremony, and then we played a mix of classical music and Beatles tunes to entertain everyone and put smiles on their faces as photos were being taken. Bring the elegance of live music to the wild and beautiful Colorado mountains. My flute and harp duo had a wonderful day playing for this charming wedding ceremony and cocktail hour at the Lyons Farmette in Lyons, Colorado. 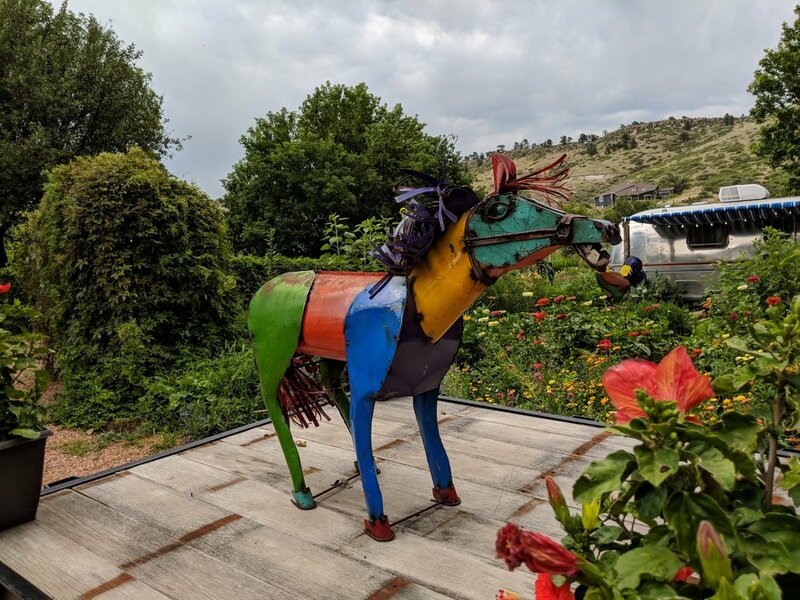 The venue features wide lawns, an assortment of farm animals, vintage farm equipment, and a riot of color in the beautiful flower gardens. Twinkle lights sparkled from everywhere, and the creek running behind the ceremony site completed the charming effect. Shortly before we started playing the prelude, the wind guested very strongly and it began to sprinkle rain. I had my music stand set up outside, and a big branch fell from the tree right where I would have been standing, so I was thankful that I wasn't there! We were so happy that the weather calmed down just as we needed to start playing the prelude music. We played elegant classical music to welcome the guests as they arrived. Then it was time for our big musical surprise, as planned by the bride. We played "Zelda's Lullaby" from the video game "The Legend of Zelda", as the bride walked down the aisle. For the recessional, we played "Shelter" by Porter Robinson and Madeon. During cocktails, we continued the video game theme. The couple chose a number of special songs to be played during cocktails, and the songs included more Zelda music and the Pokemon Center theme. Many people recognized the tunes and were very excited and surprised to hear songs that they knew from the video games. The tunes worked perfectly on flute and harp. Whether your love Zelda music or want another unique them for your wedding, I can make it happen. Contact me today! Towards the end of July, I played for a wedding vow renewal ceremony on the Vail Wedding Deck. There was a pretty good chance of thunderstorms in Vail that afternoon, but the rain held off, allowing for the ceremony to take place under the sunshine and occasional clouds. The wind was extremely gusty, and it brought in smoke from the southern Colorado wildfires, but that just added a mysterious and magical quality to the setting. I played a mix of classical and contemporary prelude music on my flute, and I used my amplification so that I could be heard over the wind. Everyone gasped in surprise and delight when the couple's spunky and adorable daughter joined me on her flute to play "Can't Help Falling in Love" as the bride walked down the aisle. The couple had been married for ten years, and their vows were as tender as first time couples, but also so refreshingly real as they had faced many years of life together. They had gone through many joys and challenges in their ten years of married life, and through them they grew closer to each other and were more in love than ever. I don't think that there was a dry eye by the time the ceremony was over. Then the bride gave everyone yet another surprise by announcing that a second child was on the way! Everyone cheered. It was quite wonderful when the officiant announced "And now I pronounce you....are still husband and wife!" at the end. I was so inspired that I thought how nice it would be to do a 15 year vow renewal with my husband in a few years. I continued to play my flute after the ceremony to add ambiance as photos were taken. "Christen played beautifully at my ten year wedding renewal! She even worked with my daughter to perform a surprise duet together as I walked down the aisle which was such a hit. Thank you so much for everything!" Enjoy the elegance and beauty of my solo flute music for your wedding ceremony! Here are solo flute music samples. In early July, my flute quartet (flute, violin, viola, cello) headed to the Colorado mountains to play for a wedding ceremony on the Vail Wedding Deck. When we arrived, the weather was unusually hot and dusty and unlike the cool crisp air that we usually expect from Vail. The sun was shining brightly and all was calm as we took the gondola up to the top of Vail Mountain. The moment we arrived, it was announced that a large storm was moving in, and the gondola would be closed! Over 400 people were trapped at the top of the mountain, including two brides. 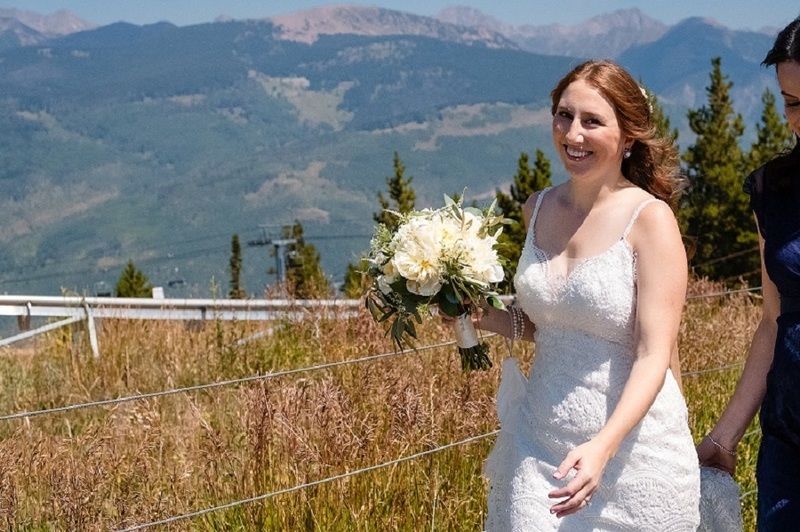 One bride had just been married and the second bride was supposed to be married at the bottom of the gondola in Vail Village. The storm rolled in, bringing with it lightning strikes and heavy rain. Our wedding party and guests were waiting at the bottom of the gondola and we were waiting at the top, and we were all hoping that our couple could have their dream outdoor wedding on top of the mountain. It must have been about an hour, but finally the announcement came through that the storm had passed and the gondola would be running again. The crowd of people erupted into big cheers, and the cheering brides were escorted onto the gondola first. Our wedding party made it to the top of the mountain for their dream wedding after all. The rain had washed away the hot and dusty feeling, and it was fresh and cool. Just as the bride and groom said "I do", the sun came out and shone on them as if for a blessing. My quartet played elegant classical music as the guests arrived for the ceremony, and we continued to play after the ceremony to accompany the wedding party as they had their pictures taken. Hire my flute quartet (flute, violin, viola, cello) to make your Colorado mountain wedding even more spectacular! Late in June, I had the privilege of playing for a wedding ceremony and cocktail hour at the Denver Botanic Gardens. It was my first time playing in the elegant Woodland Mosaic Garden, which is my favorite garden wedding site. The sun went behind clouds, and what started as a baking hot day turned into a cool day with a gentle breeze. The leafy canopy of trees arched over the conservatory and the sound of singing birds mingled Snow White style with our Disney themed music. At the bride's request, and to my great delight, we played a lot of Disney pieces, and I even got to make a special arrangement of "A Dream is a Wish Your Heart Makes" from Cinderella to play as the wedding party walked down the aisle. The ceremony and cocktail hour came off beautifully, and as cocktails were ending, a big gust of wind brought in a smattering of rain, and the guests moved to the reception location to enjoy a tropical inspired feast. Are you getting married in the Denver Botanic Gardens? I love playing there because I'm passionate about gardening and plants. I'm familiar with all of the wedding sites at the Gardens.. Learn how to add our beautiful music to your wedding! In mid-December, I headed up to Dillon, Colorado to play solo flute for an outdoor wedding ceremony on Sapphire Point Overlook. Sapphire Point has stunning views of the Dillon Reservoir and the surrounding mountains. 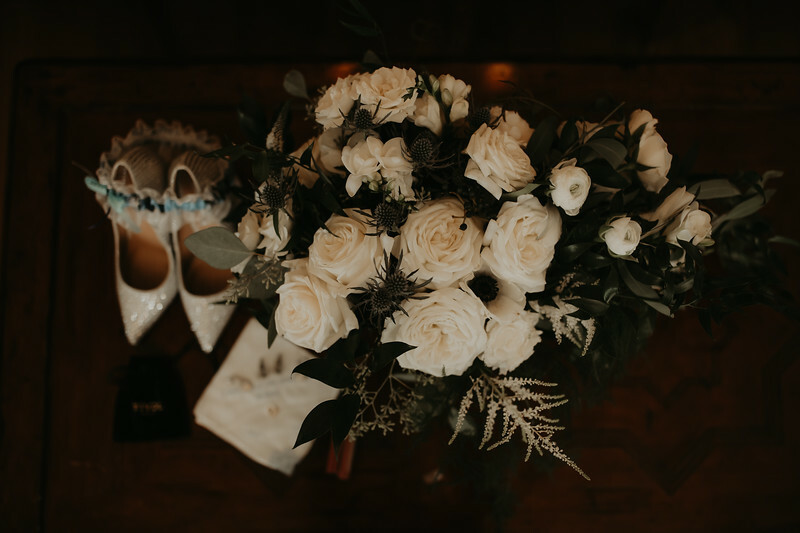 The mountains and pines were covered with snow, making an incredibly romantic setting for this Texas couple's wedding ceremony. I helped the guests feel warmer by playing a mix of contemporary, jazz, and Christmas music as they arrived and were seated. I think that "Chestnuts Roasting on an Open Fire" was particularly inviting to all of us in the steady wind and freezing temperatures. The ceremony was fairly short and then I continued to play after the ceremony concluded while the wedding party had their photos taken. I can play my flute as long as the temperatures stay above freezing, but the temperatures were below freezing, and soon the inside of my flute was completely covered in a thick layer of ice from the moisture in my breath. I quickly changed flutes to my backup flute but soon that one froze too! Since a few keys froze together, I just avoided the notes that I couldn't play until the end of my booked time. It was quite an adventure! Hire me to play my magical and romantic solo flute music at your wedding. 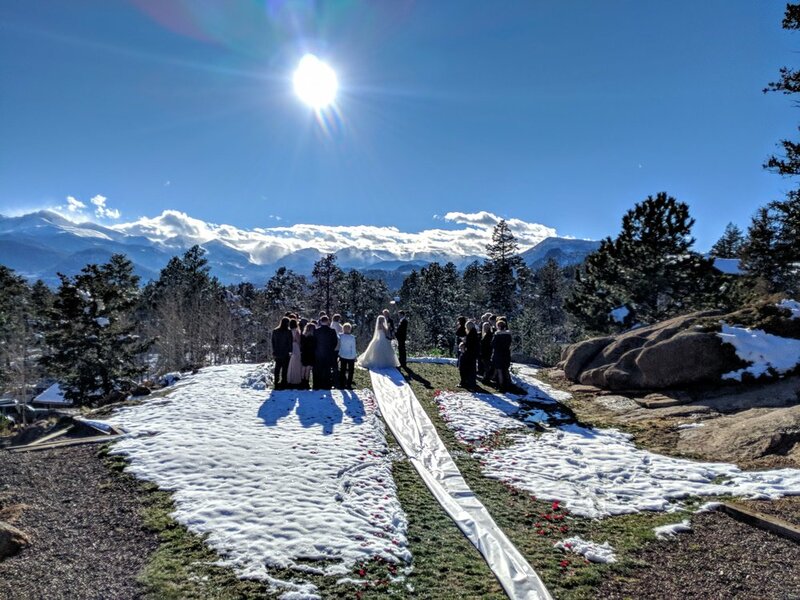 Around Christmas time, I played solo flute for an intimate elopement wedding at Della Terra Chateau in Estes Park, Colorado. The bride and groom chose to celebrate each other in a private destination ceremony, and I felt so privileged to be a part of their special day. Even though there were no guests, the couple chose to celebrate with a traditional wedding ceremony. 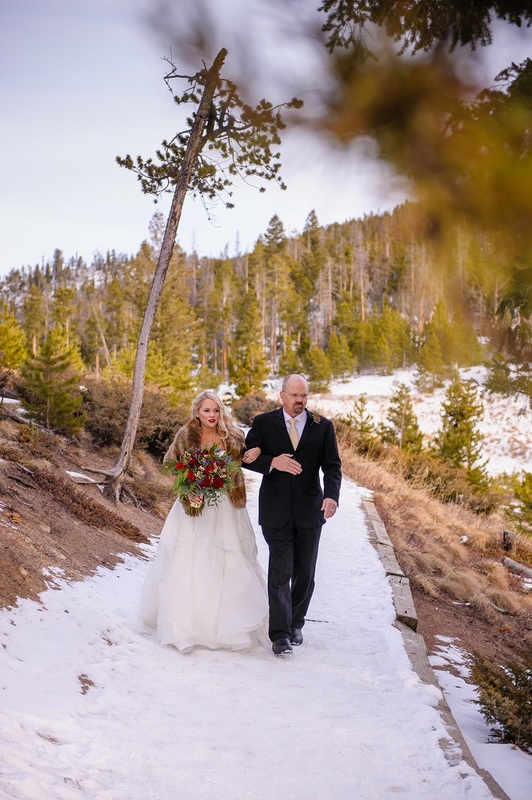 The bride's dream was to have a magical outdoor ceremony in a snowy mountain setting. Despite the frosty day, there wasn't any snow on the ground, but there was a chance of snow, and we were all hoping for the best. A few flakes of snow ended up falling during and after the ceremony, and the mountain peaks in the background also had some white, completing a romantic winter backdrop. Since the temperature was well below freezing, and cold enough for ice to form inside my flute, I had to play my flute inside and let my sound float out the windows and doors. The couple was married outside on the patio and they were still able to hear my music clearly. The bride wore a beautiful wedding gown, crown, and a furry white shawl, just like an enchanted snow princess. The couple selected a set of familiar contemporary songs from my current repertoire, and they customized the set list with additional song requests. I really enjoyed learning the new songs and adapting the vocal parts and instrumental interludes for solo flute. Because of the frosty weather, the bride and groom decided to have their after-ceremony celebration indoors. The inside of the chateau was dripping with Christmas elegance, and we stayed toasty warm in front of one of several cheerfully crackling fires. I played "Perfect" by Ed Sheeran for the couple's first dance as a married couple. The simplicity of the dance with just the two of them serenaded by my flute was very sweet and romantic. I continued to play while they cut and ate their cake, toasted with champagne, and while they opened their gifts to each other. Being focused completely on each other was such a lovely way for them to spend their first few hours as a married couple. Add the versatile music of the flute to your wedding ceremony or event. Listen to Music Samples. At the beginning of autumn, my flute quartet (flute, violin, viola, cello) headed down to Vail, Colorado to play music for a wedding ceremony at the Donovan Pavilion. The drive up to Vail was the most beautiful drive of the whole year. The first snow had just fallen the night before and the aspens were in peak season with their golden yellow leaves. When the sun shone, the aspens glowed, gradually making way to dark pines dusted with fresh snow at the tops of the mountains. Behind the mountain peeks, storm clouds made a dramatic and imposing backdrop. The rain and wind from a large cold front was quickly moving in, and when it was time for our quartet to start playing prelude music, it was sprinkling rain and the wind blew in from the west, bringing in clouds and cold temperatures. We couldn't play the wedding music outside because of the weather so, with the help of my high quality sound system, we were able to play indoors and still be heard clearly outside. We played a mix of contemporary music and hymns for the prelude and then played a traditional processional. The wedding ceremony was so elegant and the wedding party braved the cold weather so that the couple could have their dream of an outdoor ceremony. The flowers and decor were romantic and glamorous with old-fashioned deep pink roses, greenery, and candles everywhere. The tables were covered in rich blue cloths accented by branches covered in deep gold. The color contrasts and textures were vibrant and luxurious. It was a chilly late summer morning when I left my house to play my flute for a wedding at Mount Princeton Hot Springs. The drive took me quickly into the mountains and even though it was a long drive, the scenery was so beautiful that the time flew by. The changes in the location and elevation continually brought new vistas. 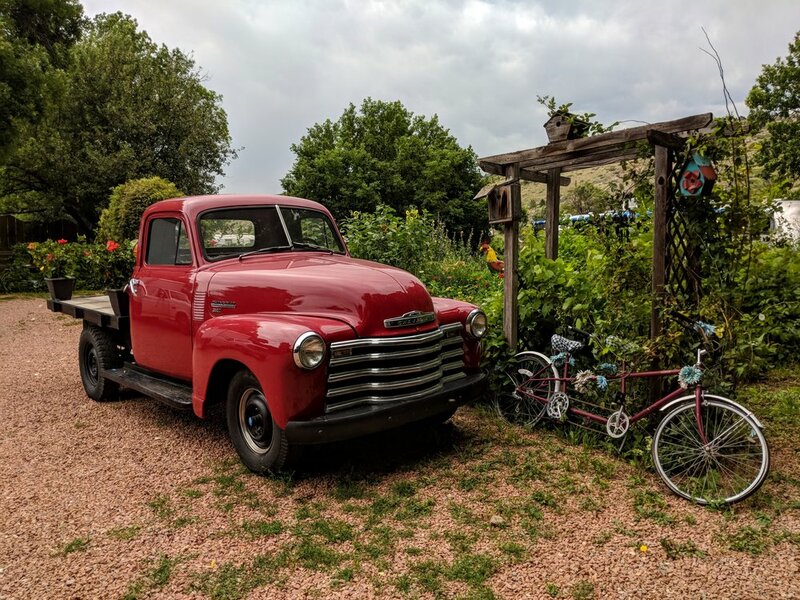 Sometimes I drove thorough deep pine forests and at other times I was surrounded by airy aspen trees, their brilliant yellow leaves sparkling in the bright autumn sunshine. At other times, there were low scrub lands or open grassy areas that stretched for miles, reminding me of the Colorado plains. The wedding venue and lawn at Mount Princeton Hot Springs had the feeling of grandeur. During the day, the reception hall was lit with golden sunlight coming through the many high windows, and at night the indoor lights shone out, illuminating the entire building. The hall opened out to a large sloping lawn with perfectly manicured emerald green grass. A river ran behind the ceremony site making a beautiful musical song that added to the ambiance of the location. The backdrop for this scene were the strangely white Chalk Cliffs that glowed in the sunshine. There was also a great view of Mount Princeton and Mt. Antero, dark with pines. The sun shone in the bright blue sky and it was a beautiful day for an outdoor wedding ceremony. It was extremely windy, so I used my Bose amplification system to make sure that our flute and harp duo would be easily heard above the wind. We serenaded the guests with elegant classical music as they arrived and then we played for the processional. The bride came riding up in a fairy tale-like Cinderella carriage that was pulled by a white horse while we played "Beauty and the Beast". The ceremony was incredibly romantic and there were many happy tears. After the ceremony, we played for the cocktail hour indoors. We played a selection of contemporary and jazz style romantic songs that worked beautifully for flute and harp and complemented the theme of the wedding. The decorations inside were stunning and flowers were everywhere. The tall windows at the back of the building boasted a grand view of the chalk cliffs. I won't forget this fairy tale wedding! Make your wedding come to life with the joyful music of my flute and violin duo. Over Labor Day weekend, my flute and guitar duo played for a beautiful wedding ceremony on the Vail Wedding Deck. I believe that it was the most beautiful day that I've ever seen on the wedding deck with lots of sunshine and blue skies, but not too hot. At the bride's request, I chose a mix of classical and contemporary music for the prelude as the guests arrived. It was a little breezy so we played with amplification to make sure that our sound carried to everyone. We learned "Going to California" from Led Zeppelin for the bridesmaids and flower girl to walk down to. After the ceremony was over, we played while photos were being taken on the wedding deck. Hire my flute and guitar duo if you want a flexible playlist for YOUR ceremony! 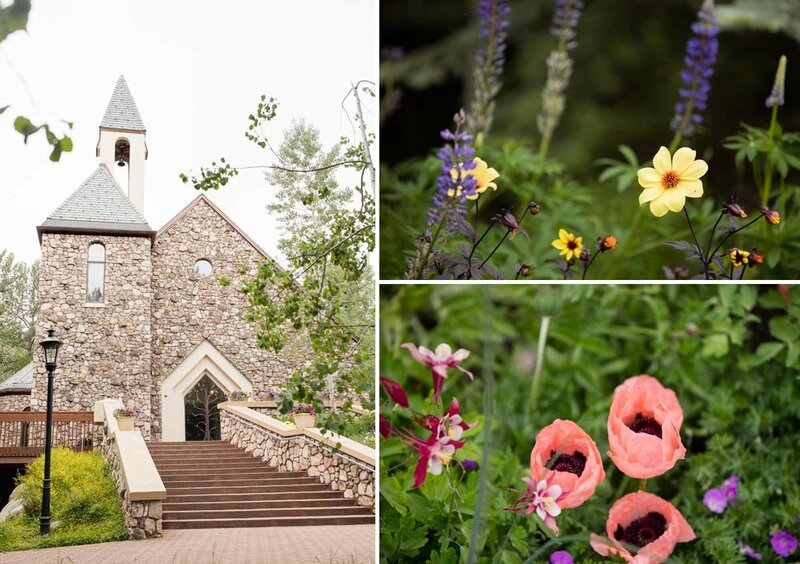 In June, my cello and piano duo played for a beautiful wedding ceremony at Beaver Creek Chapel. The bride made romantic music selections and a couple of her special requests included "Hymn by the O'Neill Brothers" and "For the Love of a Princess" from Braveheart. 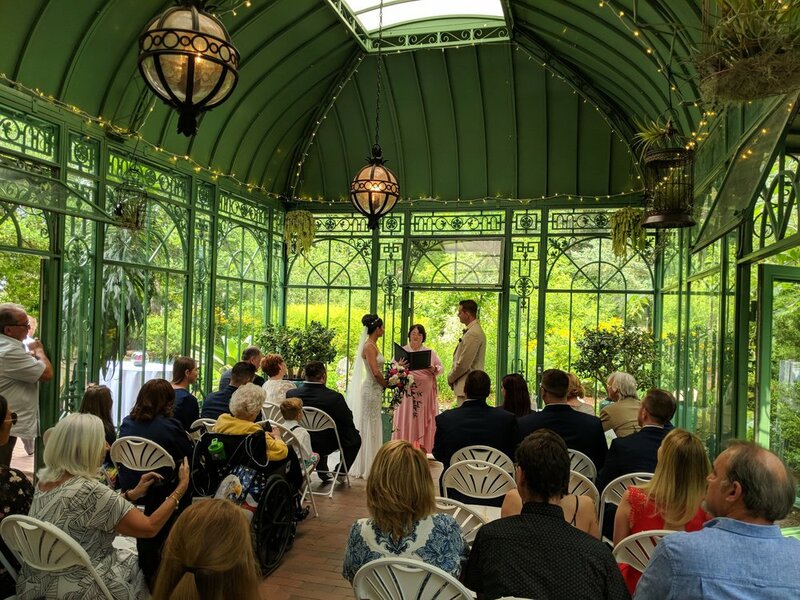 Beaver Creek Chapel is a wonderful acoustical space for live music and they also have a quality piano onsite, a perfect complement to the elegant classical music, love songs and hymns that the bride chose for her ceremony. The big day finally arrived! Ashley contacted me almost two years ago because she wanted to make sure that she reserved our flute and violin duo for her wedding day in Vail. 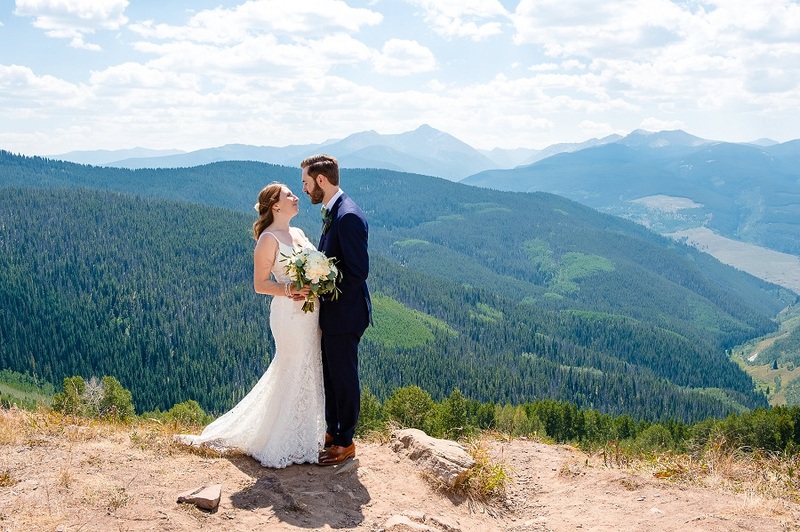 Her special day finally arrived full of sunshine and mid-summer mountain beauty. 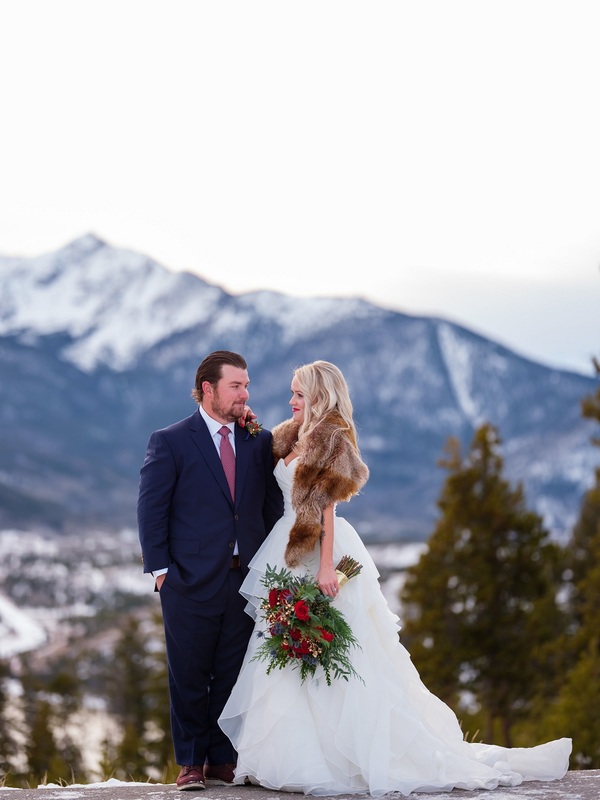 The Gore Range provided a gorgeous backdrop to the wedding ceremony, which took place outdoors on the Vail Wedding Island. My violinist and I played contemporary prelude music as the guests enjoyed cocktails and socialized before the ceremony. The refreshing drinks kept everyone cool before the ceremony and it also provided lots of great photo opportunities. 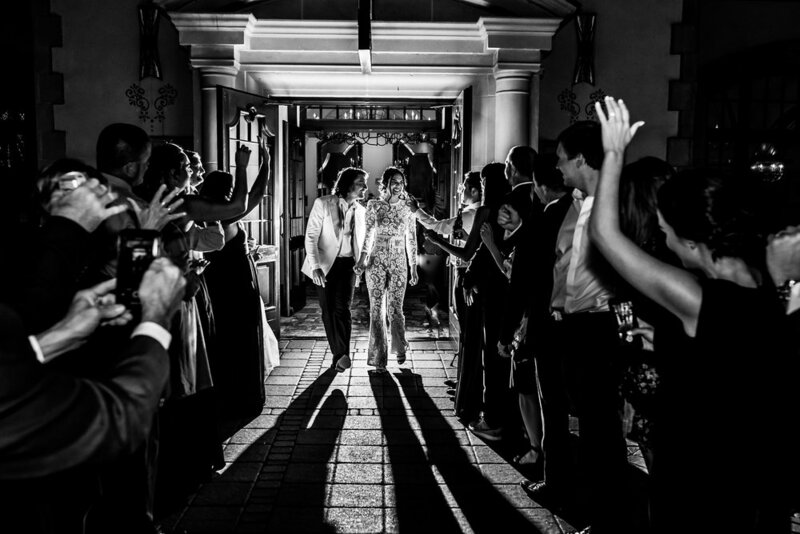 The special part of the processional was our collaboration with the bride's best friend and singer, Allie. I made a custom music arrangement of "I Will" by the Beatles and Allie sang along with our duo for the procession of the flower girl and ring bearer. It was the sweetest most meaningful moment, and the fact that the very young ring bearer didn't want to walk down the aisle at all made it even more charming, and brought about some chuckles from everyone.